The debate over monetary policy clouds the bigger task facing Taiwan’s economy. When talking about monetary policy in Asia, Japan and South Korea are usually the first two countries mentioned. Indeed, Japan, with its adoption of “Abenomics,” has pursued a bold monetary experiment to reinflate both the economy and investor sentiment through unprecedented monetary stimulus. South Korea also has a perennial monetary debate: To what extent should the Bank of Korea base monetary policy on the economic interests of the influential chaebol versus small and medium enterprises and consumers. Currently, however, one of the most interesting monetary debates is in Taiwan. With tepid economic growth and sluggish exports in 2013, coupled with a plunging Japanese yen, some Taiwanese exporters have called for a significant devaluation of the New Taiwanese Dollar (NTD) to maintain regional competitiveness. Perng Fai-nan, the central bank governor, has rejected such calls. A significant currency devaluation, he argues, would not only be difficult in the current environment, but would also delay firms from making needed structural reforms. The current debate thus serves as a proxy discussion for Taiwan’s economic future where difficult decisions must be made to balance the conflicting interests of domestic stakeholders, while also promoting long-term economic competitiveness with limited policy tools. In November, Morris Chang, the outspoken CEO of Taiwan Semiconductor Manufacturing Company (TSMC), launched his latest round of scathing criticism of monetary policy. Chang stated that the NTD was clearly “overvalued” versus regional currencies, and that the central bank should pursue a policy of competitive depreciation to boost exporters’ earnings and workers’ salaries. Chang’s criticism of Perng was not isolated: Taiwanese legislators echoed many of the same concerns weeks later at a legislative hearing of the finance committee. Perng has staunchly defended the central bank’s monetary policy, sometimes through indirect criticism. When asked of Chang’s pointed concerns, Perng commented that he had not heard officials at Mediatek, a mobile chip supplier, or Giant Manufacturing, a bicycle maker, express similar concerns even though they charge a premium for their products. He has gone to extraordinary lengths to make the case: He released a “public letter” on December 22 on the central bank’s website to explain the issues at stake. 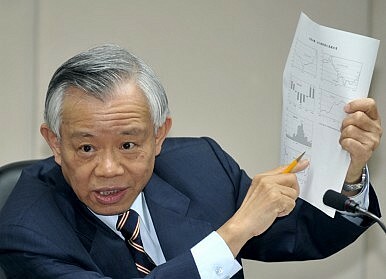 Perng’s explanations have focused on two major areas that indicate the deep connection of the current debate to future economic policy: 1) A defense of the need to balance competing domestic interests via monetary policy; 2) A broader macroeconomic argument regarding the limitation of the central bank to maintain a sustained devaluation and the need for Taiwanese firms to increase investment and move up the value-added product ladder. In both the public letter and his report to the legislature, Perng recognized the conflicts inherent in monetary policy: exporters hope for a substantial devaluation to increase price competitiveness abroad; importers and consumers hope for a substantial appreciation to decrease the cost of imported goods, including the nearly 15,000,000 million motorcycle owners that purchase imported fuel. Whatever policy is ultimately pursued, one of the stakeholder groups will be hurt. Historically, however, the exporters’ argument has tended to crowd out importers and consumers. The proof for this is the political bias to look first at the export growth rate, while other measures, such as inflation, have less importance. Perng also tried to explain the confines of using monetary policy to improve economic growth in the current environment. Taiwan’s central bank publicly adopts a “managed float” currency regime. This means that the central bank generally allows supply and demand in the foreign exchange market to set the exchange rate. However, the bank will intervene when there is a perceived “imbalance” that could threaten financial or economic stability. Historically, the central bank sometimes wielded this power to devalue the NTD and boost exporters’ earnings. Indeed, the fact that Taiwan, a small, open trading nation had foreign exchange reserves totaling $412.6 billion in October 2013 should provide cursory evidence of intervention. In the current economic environment, however, it is not clear how such a policy would even work. The NTD has actually depreciated on a trade-weighted basis since late 2012, and at a greater rate over the same time period than the Korean won, which has actually appreciated. While exporters would like to see a more robust NTD depreciation against the yen (and Japanese electronics firms), that is highly unlikely: While Taiwan’s Central Bank has a limited mandate to intervene, the Bank of Japan has publicly announced an inflation target of 2 percent by 2015. With limited tools to boost exports, Perng has focused on increasing long-term economic competitiveness. Indeed, the main economic problem is not primarily monetary in nature, but firms’ lack of domestic investment: Taiwan’s level of domestic investment fell from 25.3 percent of GDP in 2000 to 19 percent of GDP in the third quarter of 2013. This fall in investment is due to myriad factors; however, Taiwanese firms’ moving operations overseas and trying to compete on price rather than value is certainly one. While other countries in the region have forced firms to compete via free-trade agreements, Taiwan cannot aggressively pursue this strategy. Recently signed FTAs with Singapore and New Zealand are a step forward, but further pacts are not likely forthcoming. Underpinning Perng’s argument for limited central bank intervention is a more inconvenient truth: Taiwan’s declining regional and global economic position (whether real or imagined) will not be revived via past mercantilist polices. The rise of South Korean chaebol occurred long before 2008 and the won’s prolonged weakness against regional currencies. Samsung, LG, and Hyundai worked hard to develop global brands that would allow the firms to compete on value-added products. Meanwhile, Japan’s economic situation is far different from Taiwan: Japan has suffered deflationary prices and languid consumer and firm sentiment for over 20 years. The sooner Taiwanese firms attempt to address current strategic problems, rather than seek relief through past policies, the sooner the real debate can begin. Erik Tollefson is a policy analyst with extensive experience in analyzing East Asian politics and economics. A previous edition of this article mistakenly identified the CEO of TSMC as Morris Cheng. His name is Morris Chang. How Bad Is Taiwan's Economy? Compared to other economies around the world, Taiwan is doing just fine.